The Kel Tech PF9 is a popular pocket pistol. It is definitely part of the potent, ultracompact, group of 9mm handguns. The PF9 was designed by Kel Tech’s founder, George Kellgren, to be a backup weapon for law enforcement and a concealed carry for civilians. Kel Tech claims the PF9 is the flattest and lightest 9mm pistol ever mass produced. A small gun like the PF9 has many options to carry. I researched some different options for you and have listed some of my top choices. I think the best Kel Tec PF9 holster is the Federal Holsterworks Hip Holster For Kel Tec PF9. It’s made from a sturdy nylon material, is ambidextrous and you can wear it as a clip or on a belt. I have some other top picks to share with you. First I’d like to talk about some pros and cons for different ways to carry. 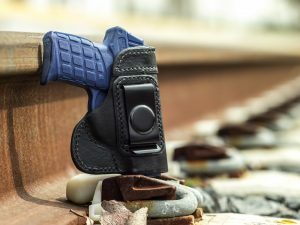 Choosing the way you carry your handgun is a personal choice with many factors involved. There is no general consensus when it comes to the way to carry or holster type. There are two things you should focus on. Comfort for you and the security of yourself and your firearm. Here’s a compiled list of pros and cons I found for various ways to carry. When you want to conceal your weapon, IWB is the most popular choice out there. The firearm is carried inside the waist of your pants. Positions can range from the appendix position to the small of back, and everywhere in between. Inside the waistband remains the most popular way to conceal because of the ease of concealment, the ease of removal and how lightweight and comfortable they are. This is the type of carry you will see off duty or suit wearing law enforcement officials use, even in the movies. This is a good way to open carry but can also be used for concealed carry. You just need to have a long enough shirt or jacket. Some people feel this is the most comfortable and natural way to carry. Outside the waistband is the most popular way to open carry since they are so comfortable. Retention is good, making them easy to draw from and re-holster. Most people prefer to have the second level (or more) of retention with outside the waistband carry. We don’t hear too much about shoulder holsters. Many think they are outdated and unsafe. If you don’t want to wear your gun on your waist, this may be a good option for you. Your pistol will be readily accessible and it is a good way to conceal, with the addition of a jacket. A lot of critics believe the shoulder holster is unsafe. As you draw your weapon you cross your own body, or innocent bystanders, with the muzzle. I found an interesting article about this. The Ankle holster may be a good option, especially for a backup weapon. Keep in mind, it is not the easiest or quickest area to draw from. They are typically worn around the ankle area and concealed by the pant leg, but some models can be attached to a boot, to keep the weight off the leg. Belly bands fit tightly around your torso and hip area. Usually secured by Velcro, they come in different sizes to accommodate different body sizes. They provide an excellent way to conceal a handgun, but they are under layers of clothes, which may be buttoned up. Accessibility may become an issue. Most belly bands have multiple pockets so you can carry accessories, like extra magazines. Most holsters don’t have room for extra magazines so this is a good way to utilize those extra pockets in your belly band. There are many holster options available to you. Personal preference will be a major factor when making your decision. I feel these top picks may be good options for you. Let’s look at some of the features and some of the pros and cons of each top pick. This holster combines the convenience and ease of a clip on with the sturdiness of a belt holster. Included is 2” belt loops and a thick metal clip. The reinforced thumb break makes drawing smooth and easy. 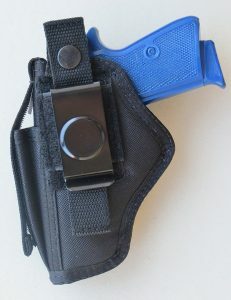 An extra magazine pouch is mounted on the front channel of the holster comes standard. It can be worn either right or left handed. This holster is lightweight and ultra thin, yet sturdy. It has a leather backing for belt carry. It can be worn strongside, crossdraw or small of back. This holster is for inside waistband only, not for outside waistband or small of back. This holster is hard molded leather, handcrafted in the USA. 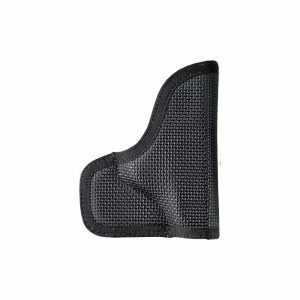 The inside of this pocket holster is made of a slick pack cloth so there is no drag while drawing your weapon. The outside is made of a material that makes it stay put, right in your pocket. This may be a good option for casual pants or shorts. As I mentioned, and as you are aware of, personal preference plays such an important role in choosing a holster for your sidearm. Do you want to open carry? Do you want to conceal? Comfort. Sturdiness. These are part of the many things we consider, when we are shopping for anything, let alone something as important as how we carry a firearm to protect ourselves and our loved ones. This holster combines the ruggedness and stability of a belt holster with the convenience of a clip-on. It's multi-layer nylon cushion fit design molds itself to the shape of the gun. 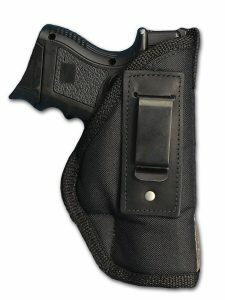 This holster is ambidextrous and includes both 2" wide belt loops and a sturdy, high carbon, black metal clip. With those things in mind, I went with the Federal Holsterworks Hip Holster for Kel Tech PF9. It’s made from a very sturdy nylon, has a reinforced thumb break for added security. You can wear this clipped onto your belt, with a strong metal clip, or with the 2” belt loops. It comes standard with an extra magazine pocket. This may be a good purchase for your Kal Tech PF9. I hope I have given you some nuggets that you can use during your hunt for your favorite holster.